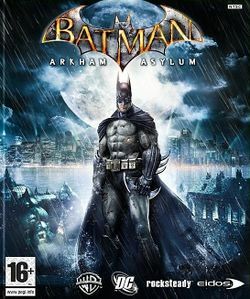 Batman: Arkham Asylum is an action-adventure Stealth video game for Microsoft Windows, PlayStation 3, and Xbox 360, and is based on DC Comics' Batman. It was developed by Rocksteady Studios and published by Eidos Interactive in conjunction with Warner Bros. and DC Comics. It is based on the long-running comic book mythos, as opposed to most other Batman games which are adaptations of the character in other media besides the source material. The game has a more closed gameplay atmosphere. In a description by Game Informer, the gameplay is reminiscent of BioShock. Gameplay places just as much focus on Batman's role as a detective as his combat prowess. Most of the game is played through an over-the-shoulder, third person perspective, similar to that of Resident Evil 4 and Dead Space. Arkham was chosen as a location because of its limitations, including the fact that it's located on an island. Arkham is a persistent location that the player is able to freely roam, including an area that serves as Batman's secret on-site Bat Cave. The game begins with Batman capturing the Joker after his latest plot, escorting him to Arkham Asylum for imprisonment where, due to the Joker's recent attack on Gotham's Blackgate prison, a large number of insane convicts have been transferred. However, the Joker has set a trap for Batman inside the asylum, using Arkham's own defenses against him and various members of Batman's rogues gallery to aid him in his cause. Batman must now not only try to escape from the hazards of Arkham, but also recapture the Joker and reveal his true intentions before he unleashes it on Gotham. This page was last edited on 11 October 2016, at 22:50. This page has been accessed 32,010 times.